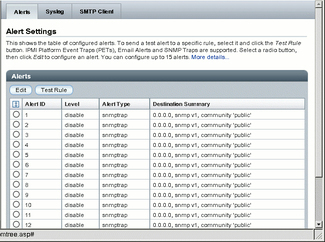 To create or edit SNMP trap alert rules in Oracle ILOM, you need the Admin (a) role enabled. To define an SNMP v3 trap alert, you must define the SNMP v3 user name must be defined in Oracle ILOM. If the SNMP v3 user name is not defined in Oracle ILOM, the SNMP v3 user receiving the SNMP alert cannot decode the SNMP v3 alert message. For more information about defining SNMP v3 authorization and SNMP v3 users in Oracle ILOM, see Managing SNMP Read and Write Access, User Accounts, and SNMP Trap Alerts (Web). For additional information about configuring alert management settings in Oracle ILOM, refer to “Managing System Alerts” in the Oracle ILOM 3.1 Configuration and Maintenance Guide. Log in to the Oracle ILOM web interface. On the left navigation panel, click ILOM Administration. The Alert Settings page appears. This page shows a table of the alerts that you can configure. You can configure up to 15 alerts. To create or modify an alert, click the alert radio button. The Create or Modify Alert dialog appears. In the Level drop-down list, select the level of the alert. In the Type drop-down list, select the alert type. 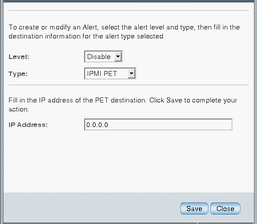 In the IP Address field, specify the alert destination IP address. Click Save for your changes to take effect.